This article is about dnd. For the Daniel Lawrence video game, see DND (video game). dnd is a role-playing video game. The name dnd is derived from the abbreviation "D&D" from the original tabletop role-playing game Dungeons & Dragons, which was released in 1974.
dnd was written in the TUTOR programming language for the PLATO system by Gary Whisenhunt and Ray Wood at Southern Illinois University in 1974 and 1975. 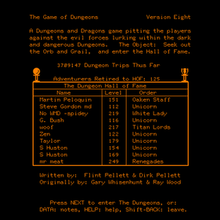 Dirk Pellett of Iowa State University and Flint Pellett of the University of Illinois made substantial enhancements to the game from 1976 to 1985.
dnd is notable for being the first interactive game to feature what would later be referred to as bosses. In dnd, players create a character and venture into the multi-level Whisenwood Dungeon (a portmanteau of the authors' last names) in search of two ultimate treasures: the grail and the orb. 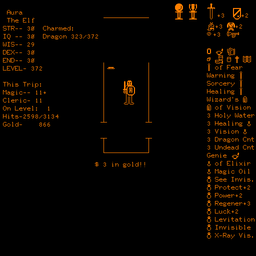 The game presents players with an overhead view of the dungeon, but also implements many basic concepts of Dungeons & Dragons. The Whisenwood dungeon consists of multiple maze-like levels, as players complete each level they are allowed to advance to the next, however players may return to previous levels and leave the dungeon altogether making dnd one of the first video games to use non-linear progression. As players complete levels they acquire new spells, weapons, and items that aid them in their quest to find the ultimate treasures. Teleporters move characters between dungeon levels. High level monsters, including a Golden Dragon that guards the Orb, are found at the end of each dungeon. Leaving the dungeon allows one to recuperate and regain spells and return later. Player about to win dnd: Character is shown in the maze, with both the Orb and Grail (as well as most other magic items and a charmed dragon). ^ Martell, Carey (26 April 2012). "Interview with creators of dnd (PLATO)". RPGFanatic.net. Archived from the original on 2013-10-27. Retrieved 2019-03-07. ^ Dear, Brian (2017). "Chapter 16: Into the Dungeon". The Friendly Orange Glow: The Untold Story of the PLATO System and the Dawn of Cyberculture. New York: Pantheon Books. pp. 294–297. ^ "Gary Whisenhunt, Ray Wood, Dirk Pellett, and Flint Pellett's DND". Armory.com. Retrieved 2008-04-08. ^ a b "dnd (The Game of Dungeons)". Universal Videogame List. Retrieved 2008-04-09. "Retro Playing Games", Computer Games, April, 2006, p. 36–37. cyber1.org – dnd as well as many other dungeon games can be played on this system. This article about a role-playing video game is a stub. You can help Wikipedia by expanding it.